Video footage shows Birmingham, Ala., Police Officer Daniel Aguirre firing his weapon at suspect Aubrey Williams, who he claimed pointed a gun at him. An Alabama police officer may have a medal he received for his actions during a robbery taken away after newly released dash-cam video appears to contradict official recounts, AL.com reports. Earlier this year, Birmingham Police Officer Daniel Aguirre was awarded the Combat Cross Medal after shooting a robbery suspect in April 2014 who, according to indictments, pointed a firearm at officers. Aguirre fired twice, hitting the suspect, Aubrey Williams, though not killing him. Williams currently faces two charges of attempted murder. 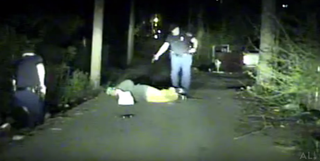 However, video obtained by AL.com through a confidential source shows Police Officer Richard Haluska handcuffing one suspect before Aguirre drops his Taser from his left hand and approaches Williams, who is on his hands and knees. As Williams falls back, Aguirre steps back himself and then fires his gun twice. Aguirre then approaches Williams and kicks a sack and a gun away from Williams. The group is demanding that Aguirre’s medal be rescinded. According to Raw Story, it is not clear if the Awards Committee or police investigators had seen the video before it was published by AL.com. Both Williams and the second suspect, Devon Brown, were charged with possession of firearms by convicted felons, and Brown was later charged with murder in an unrelated case. Prosecutors, however, are defending Aguirre, saying that the video may not be showing the whole story, and pointing out that the dash cam began recording in the middle of the encounter. “Just because it’s not on video, it doesn’t mean it didn’t occur,” Deputy Jefferson County District Attorney Matt Hart told AL.com. “The most important part of this encounter was there was no loss of life, but the incident does underscore the dangers of police work,” Birmingham Police Department Public Information Officer Lt. Sean Edwards added. However, Williams’ attorney, Emory Anthony, is adamant that the video shows that Williams never pointed a gun at officers. Read more at AL.com and Raw Story.